While cleaning out the CPARC shack last month, we happened upon a helical duplexer set, in additional to various other pieces of equipment, which seem to indicate that someone in the club in the 1990s was collecting parts for a homebrew 2m repeater. Duplexers are an interesting part of a repeater. Repeaters are a common radio installation where many low-power mobile radios transmit on a single frequency, which is received by a strategically placed receiver. This received signal is then re-transmitted at higher power, and usually a fixed frequency offset, so that every other mobile unit can hear each other, as long as they're within the coverage area of the repeater. 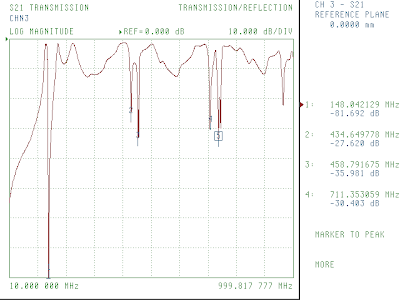 The problem with repeaters that you need duplexers to solve is the fact that you are trying to receive and transmit on two unusually close frequencies at the same time from the same place. 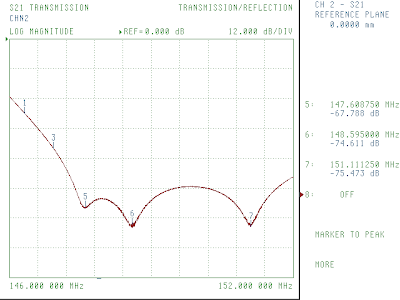 For example, a 2 meter (146MHz) repeater will only have a 600kHz offset between the input and output. Even using two separate antennas, when you're trying to transmit 15 watts and still receive a 2μV signal only 600kHz away from it, things can prove problematic. Duplexers solve this puzzle by being a pair of ridiculously good notch filters; one to filter out the input frequency from the transmitted signal, and a second to filter out the transmitted frequency from the receiver. Notch filters are traditionally built from inductors and capacitors, but each pole of a passive filter only gets you 20dB of attenuation per decade of frequency change. A good rule of thumb for the needed isolation between the two sides of a duplexer is 90dB, and instead of being a decade apart (i.e. 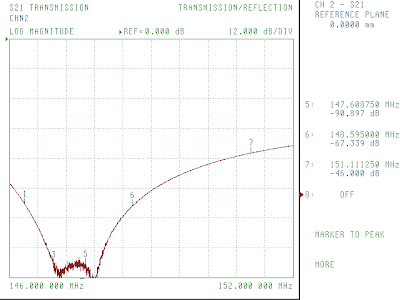 14MHz vs 140MHz), a typical VHF repeater only has 0.00178 decades of separation between the input and output frequencies (146.160MHz vs 146.760MHz). Using traditional passive filters, you would need to build a 2,500 pole filter to get the needed 90dB, which is comically large. Duplexers instead operate on the principle of using a resonant chamber as the notch filter, at which point getting a Q in the thousands with only a few stages becomes possible. These resonant chambers are built to roughly the correct size, with a fine tuning rod held in place by a lock nut. Due to the needed high Q of the notch filters, the tuning elements, and often the entire resonance chamber, are silver plated to reduce resistive loss. The best duplexers are made with full size 1/4-wave cavities, but at 146MHz this works out to be almost two feet long, and 4-6" in diameter, per stage. Helical duplexers trade slightly lower isolation and efficiency for being significantly smaller; slightly more than 2.5" long for 2m. This is done by using two helical conductors to lower the cavity resonance to the frequency of interest, which can been seen in the two photos above. Of course, one of the advantages of now being an EE grad student at Cal Poly SLO is that I have access to a fully equipped microwave lab, where I can use a vector network analyzer to feed test signals into these filters and see exactly how much they filter out in a specified frequency range. As a first pass, I swept both filters from 10MHz up to 1GHz. 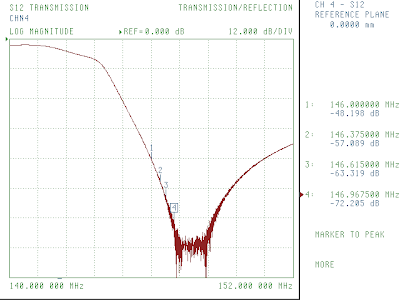 The response of the one labeled "Reject High" came out about as expected; a very deep notch at the top of the 2m band, spurious notches at all the odd harmonics (440MHz, 740MHz, etc), and high attenuation as we approach DC, since high notch filters use capacitive intra-stage coupling (where low notch filters use inductive intra-stage coupling). Performing the same sweep for the "Reject Low" filter gives somewhat less encouraging results. 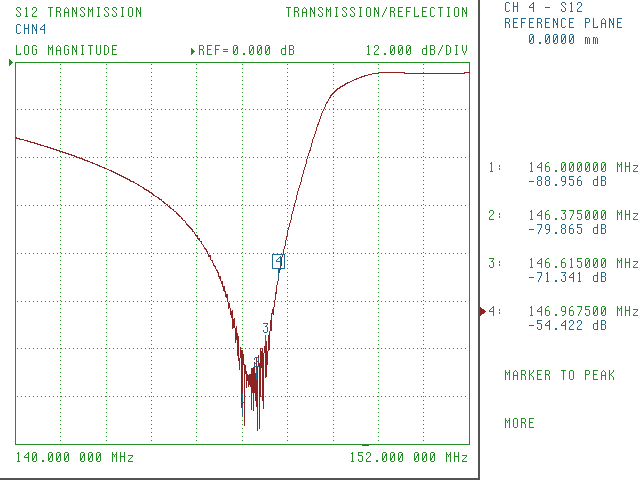 As expected, there is a fundamental notch at 146MHz with higher notches at odd harmonics, and the attenuation goes to zero towards DC due to inductive coupling, but the huge notch at 211MHz is unexpected. 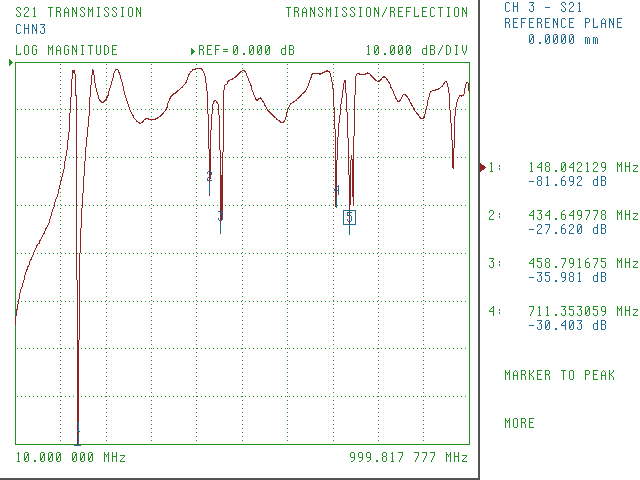 Re-calibrating the VNA to just focus in on the 2m band, the "Reject High" filter yet again gives the expected results. 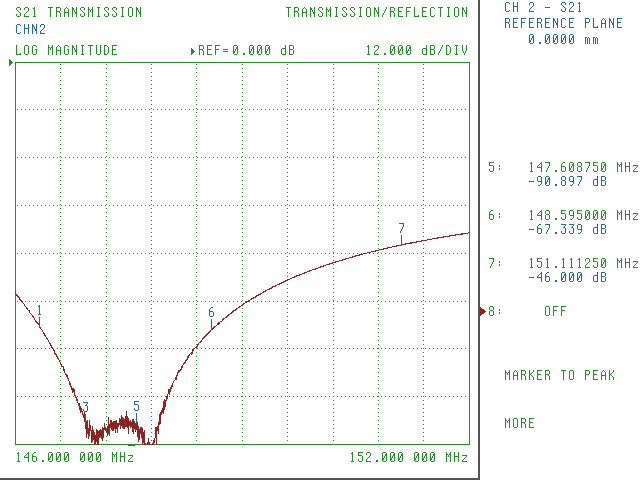 The four markers are the input and output ranges for the lower repeater channels. 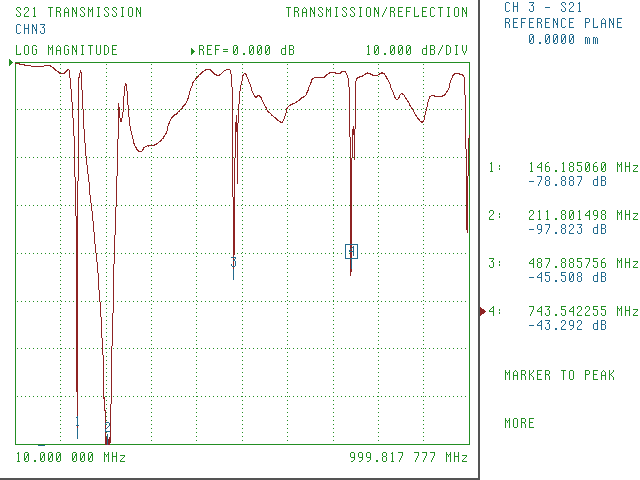 The filter's notch likely goes quite a bit lower than shown, but that's where the VNA hit the noise floor. Ideally, the slope between ~0dB and lots of dB attenuation would be as far apart as the markers 1 and 3 or 2 and 4, but that just isn't possible without resonant length cavities. Interestingly, the "Reject Low" filter seems to have a better Q to it, which is probably just because whomever last tuned these did a better job on this one. 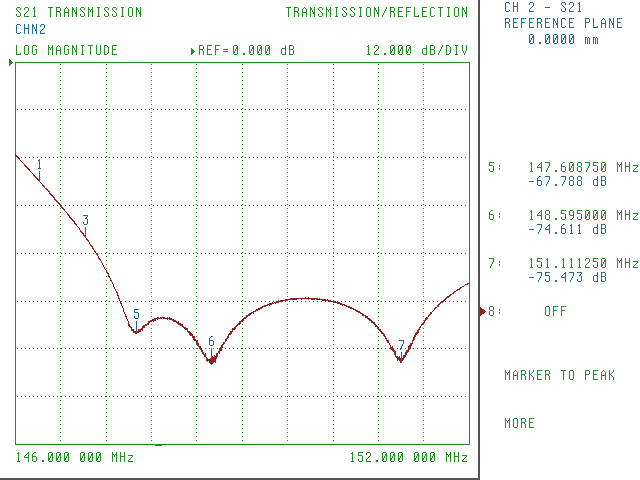 Notice how both filters have very different responses above and below their notch frequencies. This is due to how each set of filters order their resonant and anti-resonant modes, to give the duplexer a steeper response in the critical 600kHz between the input and output. A good explanation of this notch-shifting concept can be found on VK6UU's article about traditional duplexers. I decided to have some fun while I had these hooked up to the VNA and practice tuning them. 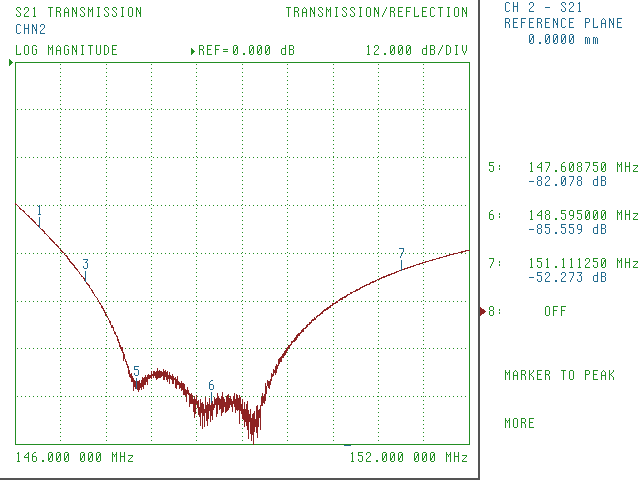 Shown here is the reject high filter with all three stages randomly tuned across the 2m band. It's hard to explain with just the plots, but it's really interesting to screw one tuning rod in or out and watch how it shifts the other two poles. Moving the highest node closer to the other two shows how the three stages can quickly create a very deep notch, once they're all properly aligned to the desired frequency. Unfortunately, due to the particularly low efficiency of helical filters, even when properly tuned, 600kHz splits mean that the attenuation at the pass band is still uncomfortably high, for a given notch frequency. 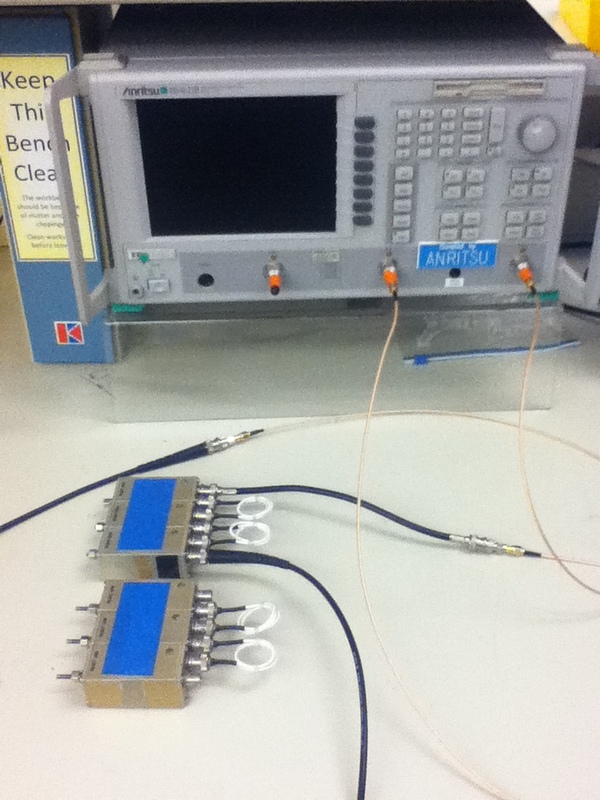 Since the trade-off is to either used a non-standard split larger than 600kHz between repeater input and output, or throw 20+ dB of your power away in each passband of the duplexer, helical filters are far from ideal for repeater service, and should only be used if size constraints leave no other choice. 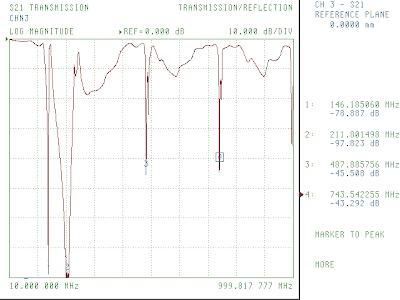 The apparently more common solution when a full-size duplexer isn't possible is to use a cross-band repeater, where the input and output frequencies are on entirely different bands (pick two of: 50MHz, 144MHz, 220MHz, 440MHz, 900MHz, etc). Now what to do with a really nice set of helical filters?